WASHINGTON: Those who smoke and drink heavily may develop pancreatic cancer at an earlier age than those who don't, according to a study published in the American Journal of Gastroenterology. The study involved 811 pancreatic cancer patients from the international database Pancreatic Cancer Collaborative Registry, which gathers information on patients with pancreatic cancer and at high-risk for developing pancreatic cancer. Citing the study, China's Xinhua news agency said Tuesday that heavy smokers were defined as those who smoked more than a pack per day, and heavy drinking was measured at about three average drinks per day. The researchers from University of Michigan Health System found the heavy smokers with pancreatic cancer were diagnosed around age 62 and heavy drinkers at age 61 almost a decade earlier than the average age of 72. 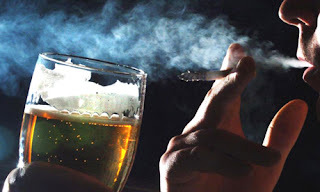 However, the harmful effects of heavy drinking and smoking could be reversed after 10 years, former smokers and drinkers who quit their habits faced no extra risk of earlier diagnosis, the study said. Thanks God! I have never learned to smoke and I don't like drinking either.